The new Subaru 2.0-liter engine FA20 was developed for the joint project of Subaru and Toyota (4U-GSE). 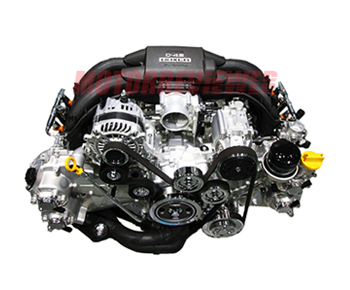 Subaru FA20 engine application is the Subaru BRZ model - light and sporty coupe. Toyota 4U-GSE engine is installed in the Toyota 86 and the Scion FR-S. The FB20 cylinder block was taken as the basis. The bottom of the engine was completely redeveloped. It has a new crankshaft, connecting rods and pistons. The engineers built square engine, which means, what the FA20 has an equal bore and stroke dimensions, giving a bore/stroke value of exactly 1:1. Also, the compression ratio is higher than the FB20, and it is 12.5:1. The FA20 has aluminum DOHC cylinder heads with four valves per cylinder. Heads equipped with variable valve timing system (Subaru AVCS) on intake and exhaust camshafts. There are some Toyota technologies in this engine such as direct fuel injection system Toyota D4S. The exhaust system includes steel 4-2-1 exhaust manifold. This naturally aspirated engine name is the FA20D. It produced 200 hp at 7000 rpm and 151 lb-ft, and it is outstanding numbers for a non-turbo 2.0-liter engine. 1. Rough idling, shakes at low rpm. That is a problem with the firmware of the ECU. It can be fixed by upgrading or reloading the Engine Control Unit's firmware. 2. The problem with a camshaft gear, which leads to a loss of oil pressure. The engine requires high premium gasoline (98 octane number) and is exacting to a quality of the engine oil. FA20DIT (and FA20F, FA20E). It is a turbocharged version of the FA20 which came to replace the old EJ205 and EJ207 engines. These versions have lower compression ratio aluminum pistons (10.6:1), redeveloped heads, which provides more airflow and optimized combustion chambers. Turbo engines got camshafts with new specs and plastic intake manifold with TGV valves inside. The FA20 DIT has Twin Scroll turbocharger Garrett MGT2259S, which produces pressure 1.1 bar (1.5 bar in over-boost mode) and makes 272 hp at 5600 rpm and 258 ft-lb of torque.